10,000 performers and shows to hit the capital in August. 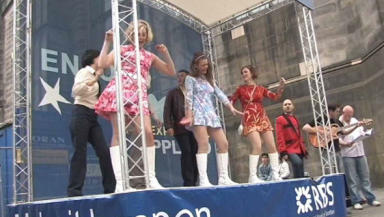 The programme for the 2009 Edinburgh festival Fringe has been launched. The event, running from August 7- 31, sees 10,000 performers and shows descending on the Scottish capital. From Denise van Outen to cricket commentator Henry Blofeld, from the poems of John Betjeman to the Lady Boys of Bangkok, the Fringe programme for 2009 is as diverse as ever. But scrutiny will fall on its creaky administration as much as on the performers. The box office catastrophe which saw the Fringe box office unable to process ticket sales at all at the start of last year's festival and eventually led to the departure of the director, John Morgan, and to significant drops in revenue, will need to be reversed and corrected. The new chief executive, Cath Mainland, a well known and capable figure around the Fringe, will inspire confidence. But the fact that Fringe Sunday has had to be cancelled for lack of funds will be another hurdle the new team will need to overcome. In the programme itself, among the wannabes and no-hopers and those who just come for the experience, there the are tasty titbits to be unearthed. There are two shows based on works by Muriel Spark, probably Scotland's most under-rated 20th century writer, The Prime of Miss Jean Brodie *and *The Girls of Slender Means. *There is also a new stage version of *The Wicker Man, the cult horror film set on a Scottish island. But the huge shows in the Meadows have survived the credit crunch with the Moscow State Circus and the Lady Boys of Bangkok vying for attention. The now almost traditional large-scale theatre show featuring a cast of comedians is this year going to be Sheridan's *School for Scandal *so if you want to see Marcus Brigstocke, Stephen K. Amos, Phil Nichol and Lionel Blair in 18th century powdered wigs and farthingales, then head for The Pleasance.